Contact Kulsum for undergraduate program questions, class permissions and appointments with the Director of Undergraduate Studies. She also assists faculty with course management and scheduling. A life-long explorer, Kulsum has traveled throughout the world and has lived on four different continents. 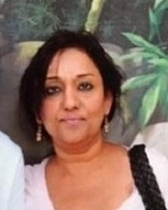 In her spare time, Kulsum enjoys attending Chicago Bulls basketball games with her two sons. She holds various IT certificates and is pursuing a BA at NU. Prior to joining Anthropology, Kulsum spent 5 years in African-American Studies.